Select Choose Alternator 55a Plain Alt. Kit 55a Plain Alt. Chr. Acc. 75a Chrome Alt. Chr. Acc. 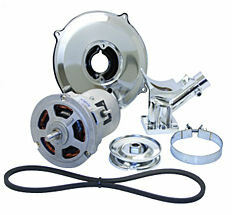 55 Amp Alternator Conversion kits replace your old 12v generator with a better charging alternator. 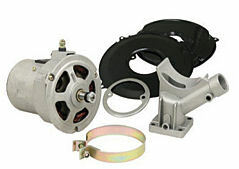 Alternators are internally regulated, so no need to buy a regulator. Plain Kit comes with a New Alternator, Stand, Strap and 3 piece Back Plate set (no belt or pulley). Also available in Plain w/Chr. Acc. W/ Pulley and belt as shown. Another Option is Chrome with Chrome Acc. as shown in a 75 amp version. Click more info to choose the one you want.